Most of the people who venture into woodturning are sooner rather than later faced with a confusing array of terms and expressions. This jargon often creates a barrier to understanding, and personal development. In this series we aim to open up this fascinating world, and remove such obstacles with a comprehensive series of explanations covering all the relevant phrases, terms and equipment used in modern turning. This will be done in five distinct sections: the lathe, turning equipment, cutting tools, wood, and finishing techniques. By doing it this way we avoid the problems of having long, boring lists of terms, and will make it more meaningful by grouping the various aspects in such a way that a broader working knowledge of the fundamental principles is gained. It will be written in such a way as to be a factual, insightful turner's companion that deals with the issues in a user-friendly way without dumbing down and losing what will be valuable information. A lathe is fundamentally a machine to revolve a piece of wood on a central axis in order to form it into a desired shape. There are many variations, but usually it is made up of five main parts ï¿½ bed, headstock, tailstock and toolrest assembly and stand as shown. This of course, excludes specialised machines, which may have more or fewer parts. Having discussed what a lathe is, and how we are going to approach this series, let's look now at the component parts of the lathe in greater detail. 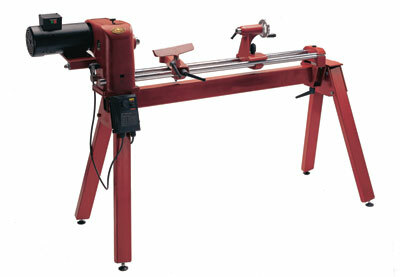 The lathe bed is the platform on which the other main elements come together to make a working machine. The bed dictates the rigidity of the lathe, and the basic alignment accuracy of the parts. The bed can be made from various materials, wood, aluminium, steel and cast iron. The form can also vary considerably, (see illustrations above). As a simple rule, the greater the mass (how much material is in it) the better the rigidity and the lower the risk of vibration. This applies equally to cast iron or steel. The basic accuracy of the overall machine will be dictated by the quality of how well the bed is manufactured. There are four main types of bed, produced in a number of variations, depending on the choice and form of material employed. The above illustrations show short sections of them in their more usual forms. The headstock, tailstock and banjo rest on and are clamped to the bed or bed bars. The bed can be cast iron or fabricated from heavy section steel or made from box section or even round bars. Regardless of its means of construction, the bed needs to be rigid to reduce vibration and accurately machined to ensure alignment of the head and tailstock. "The lathe bed is the platform on which the other main elements come together to make a working machine"